Refurbished by Philips in 2009. Software level: R 7.2.9. 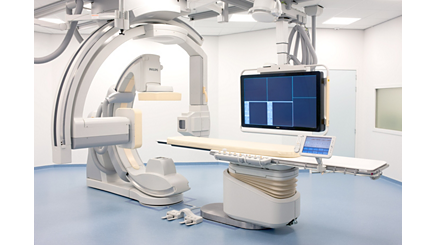 Ceiling-Mounted C-arm, 20 inch / 48cm Flat Detector, MRC 0407 X-Ray Tube, Valara CFD 100kW Generator, Vascular License, 0.5,1,2,3,6 Frames-Per-Second, Digital Subtraction Angio XRES, Pivot table. Four (4) Ceiling-Suspended LCD Monitors. Available Now.